Suitable for the applications don’t need high control precision, like fans and pumps. 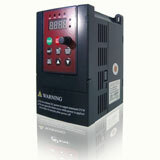 The frequency inverter can be used for dragging multiple motors. Suitable for the system require less torque control accuracy, such as wire-wound, drawing machines, etc. 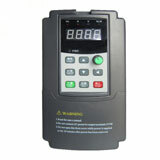 In torque control mode, the speed of the motor is determined by the loads on the motor, its acceleration and deceleration speed is no longer controlled by the frequency inverter acc/dec time. Tip: in vector control mode, you need to know more about the electric motor parameters, in order to get full advantages of the vector control frequency inverter. Slip frequency control is direct controlling the torque, which is based on the V/f control mode, in accordance with the actual speed of the induction motor corresponding power frequency, adjusting the inverter output frequency with desired torque, therefore make the induction motor have a corresponding output torque. In this control method, needs to install a speed sensor in the control system, sometimes needs to install additional current feedback to control the frequency and current. So it is a closed-loop control mode, the frequency inverter has a good stability, and has a great response characteristics for fast acceleration and deceleration and load changes.